Channel your inner cowgirl! 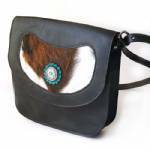 Black leather flap-closure purse with hair-on cowhide inlay and turquoise leather accents. Full leather lining, interior zippered pocket, key leash with snap, and zippered front pocket. Stainless steel and solid brass hardware. Discounted price will be shown in your cart.